The last time I saw Weezer was in the tiny confines of the Roseland Theater in Portland four years ago where they played an eclectic set in front of 1,000 fans or so that featured an acoustic first half followed by a plugged in performance of their then latest album Everything Will Be Alright In The End . Well, Weezer played both songs on Sunday along with 18 more in a career spanning set that lasted an efficient hour and 15 minutes showing these go-their-own way rockers have the renown and prowess to command the large stage and fill the rafters. Weezer got things started as a barbershop quartet playing a short rendition of “Beverly Hills” before taking the stage, presented as a 1960s diner (which later changed to an 1980s garage and again later to a modern set-up with prolific lights and fireballs! ), and opening the show with their classic “Buddy Holly“ followed by “(If You’re Wondering If I Want You To) I Want You To.” They didn’t waste much time before hitting the covers as singer Rivers Cuomo said “Let’s go to Africa” and wouldn’t you know it, the crowd, filled with many born long after the original’s heyday, sang every verse. 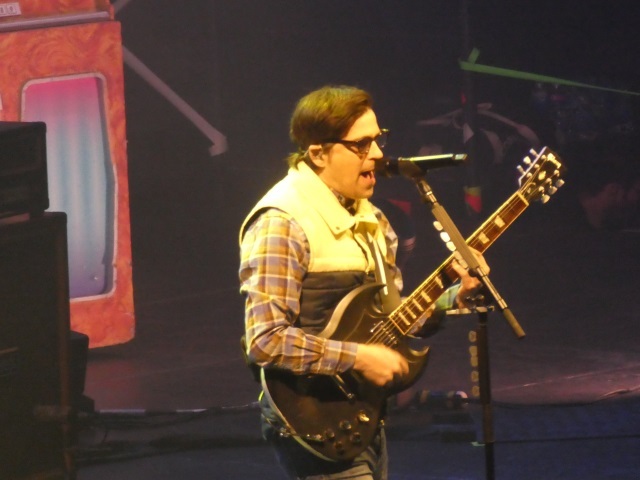 Weezer performed all their radio hits including “The Good Life, “Island in the Sun,” “Undone – The Sweater Song,” Hash Pipe,” which ended the main set, and the encore closer “Say It Ain’t So.” They also slipped in “My Name is Jonas” perhaps a better choice as the show starter like it was earlier on the tour. Weezer celebrates 25 years in 2019 and this song opened their debut eponymous album from 1994. In fact, Weezer pulled a bunch from that smash album, (aka Blue Album ) a few from four of their color-themed albums (Black , Teal , Red and Green – White got dissed) and some in between like “Perfect Situation” off 2005’s Make Believe and 2009’s Raditude made an appearance with the second song on the night. Cuomo (who could easily be the brother of my high school band teacher) was a bit sharp at times vocally but nothing too caustic. 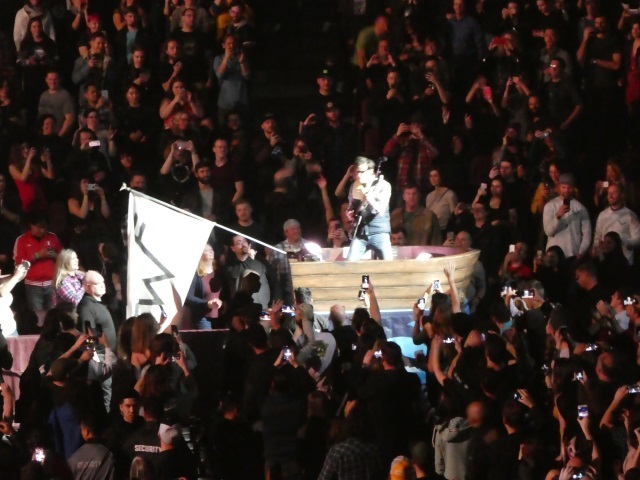 He also spent time in a boat, seriously a boat, while providing the heavy chords on “Paranoid” as guitarist Brian Bell took over vocal duties, and during a short acoustic set featuring “Perfect Situation” and “Stand By Me” as the band (rounded out with Patrick Wilson on drums and Scott Shriner on bass) took a break but returned for the fourth cover of the evening on Jane Addictions” “Up the Beach.” Weezer played six covers overall, five of those from the Teal album. The very fun and eventual Weezer classic “Can’t Knock the Hustle” was the lone song off the recently released Black album. It’s a bit hard to not like Weezer. They ooze some farcicality then combine frolicking pop chords with a strong blend of rock that fully tempers any perceived bubblegum letting you know they take their craft rather seriously. But you kind of get the feeling as if this band, with the name Weezer, has a smirk on their face the entire time. They don’t sound exactly innovative but they come across fully original. Can you name another band like them? Perhaps it lies in their unconventional approach to song writing. Then of all covers they choose Toto’s “Africa.” It just falls right in line with the Weezer brand. Their renditions of a-ha’s “Take On Me,” Tears for Fears “Everybody Wants to Rule the World” and even Black Sabbath’s “Paranoid” all somehow fit in with the entire setlist as Weezer managed to keep the purity of the originals while incorporating the Weezer state of mind. With regards for the Pixies, I can’t say I’m much of a fan at least in terms of knowing lots of their songs or even identifying them when a Pixies song goes out on the airwaves. Yeah, I know. But I’ve been alive for some time and don’t get my time too often on AM radio so I have heard of them as the Pixies were quite big during the college years. As I acquainted myself with their music in the last few weeks I experienced a familiar refrain in my life when I said, “Oh that’s who sings that song.” Yeah I know. Always late to the party. Despite that, Pixies might fare better in a much smaller setting. Their music doesn’t boast the big sounds and slick guitar chords needed to translate into an arena setting and a mostly blasé stage presence doesn’t help either. They came across more as an opening act than the co-headliner bill and singer Black Francis either gets lots of help in the studio or needs a day off. There were a few highlights like their popular “Where is My Mind” and “Here Comes Your Man” but after Francis said something about a train wreck more than halfway through the set I mostly tuned out. I wasn’t sure what to think with the Spanish punk rock “Isla De Encanta.” Pixies played for about an hour 10 minutes with no encore. Nice to see a Canadian review Sir! Sometimes a get of a dodge card needs to be played! Weezer I really liked and still do the Blue album…that record is amazing as In My Garage is a slick great track! After that things kinda tailed off with me on following these guys..why I have no idea.. Thanks deke. I really need to dive more into their albums. They are talented musicians and do it with such fun!